Custom made dress in very good condition that was worn for 10 months. Selling due to growth spurt. 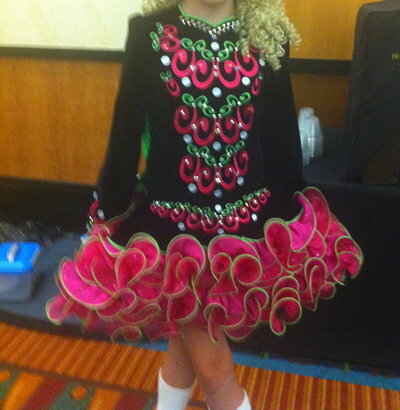 Bodice is black velvet with large Swarovski crystals and contemporary embroidery in fuchsia, white and apple green. The skirt is a fuchsia organza fabric with fuchsia crystals, piped in apple green on edges. 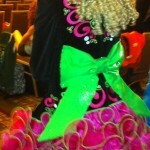 The back has a large green organza bow with green crystals. The inside lining of the dress is fuchsia and black leopard print. Included is a fuchsia headband with large Swarovski Crystals and a fuchsia flower. Room to let out is 1″ in bodice, and 2″ in sleeve length.